Proudly serving Nantucket since 1975! This project was unique because it was done in the winter. When the old system was removed, the new one needed to be on line that evening. 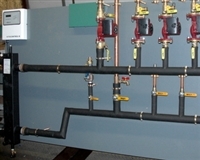 To accomplish this the pump and control board had to be prefabricated in our shop, then Ryder electric wired it and Ramos Plumbing piped the new boilers for propane. 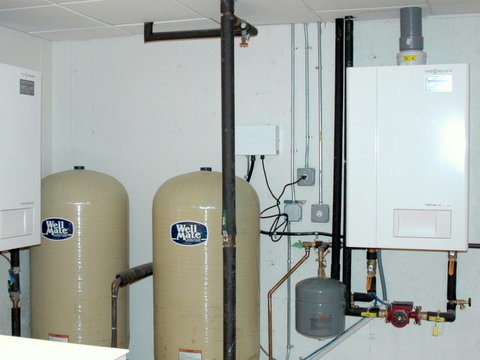 With that done, the next morning we drained the system, removed the old equipment, delivered and installed the prefabbed pumping station, connected it to the new boilers and got the system back on line in 1 long day. The Eel Point Project is one of my favorites. When we arrived, the home didn't heat well. 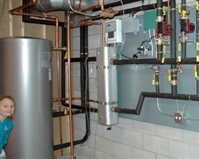 The poorly designed and installed "system" did not fit the house's needs, leaving the homeowner with an inefficient and ineffective system that wasted money on propane and usually didn't heat the home to a comfortable temperature. It just looked to me like the original heating contractor did not take pride in his work. It does not take that much more time to pay attention to details and make things look nice. 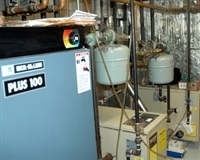 As the cost of heating fuel continues to rise, conventional boilers and controls are making less sense. 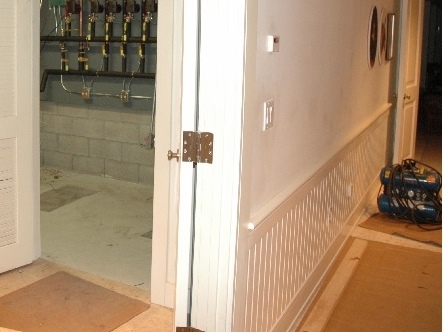 The new system in the Eel Point home is nearly 97% efficient thanks to a state-of-the-art control system. The cost of this conversion was about the cost of a higher-end SUV. 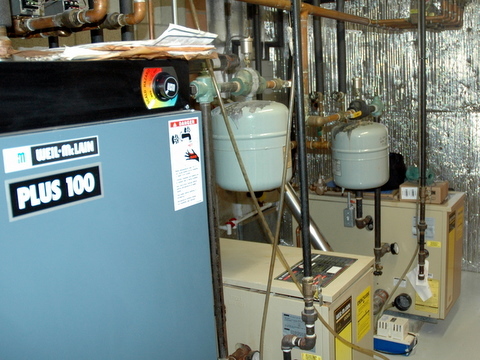 Unlike that SUV, a good heating system- like this one, will reliably heat your home for decades and save you money every time the fuel truck comes by, not needing to add as much propane to fill the tank. 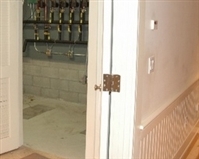 This was the old boiler room. 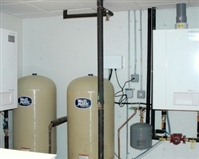 Another shot of the old boiler room. Organized confusion. 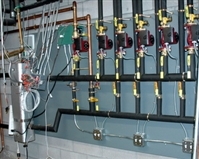 Is this a boiler room or a telephone switching station? 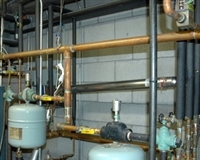 These zone valves supplied five air handlers in the old system. 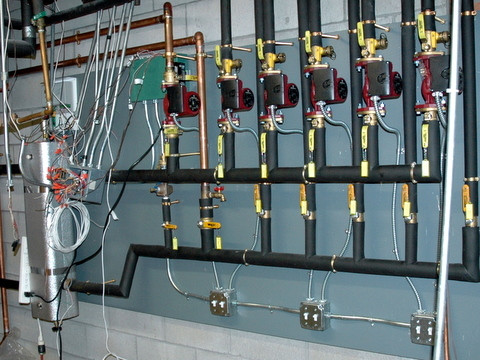 In large systems like this, zone valves typically won't provide enough water flow to satisfy high heat demand (such as when when you come back and want to bring the house from a low set-point to something livable). 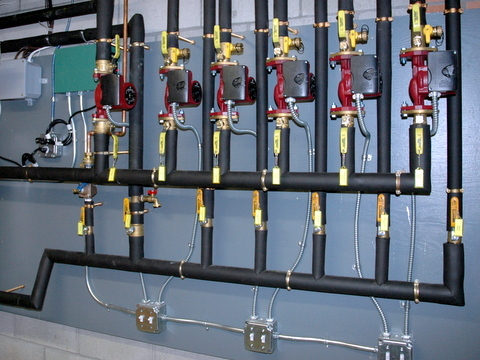 Indeed, the old system depended on one pump and seven zone valves. 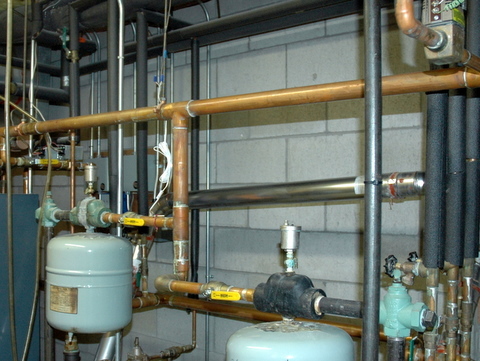 Because the pump was sized to the boiler, but not to the load of the air handlers, the old system couldn't keep up on cold nights. 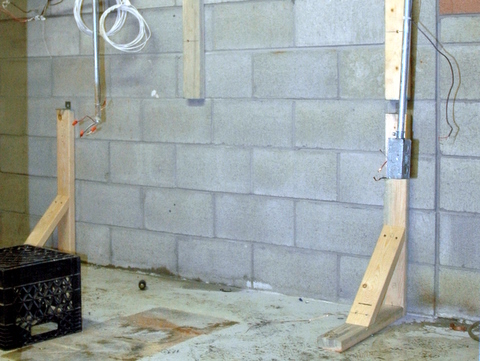 Here we are in the process of fabricating the pumping station in our shop. After painting the board, we sketch out the system on brown paper. 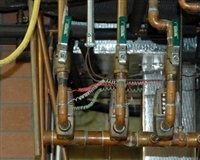 We then take the brown paper to the job site to make sure that it matches up perfectly with existing electrical and piping connections. 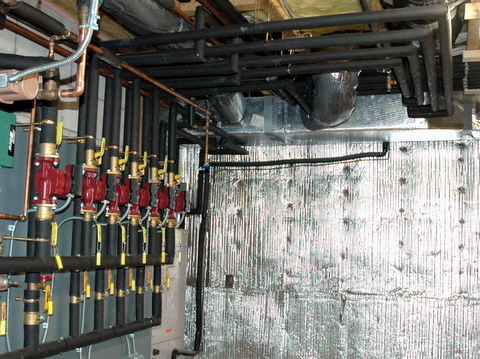 This kind of preparation significantly reduces installation time and virtually eliminates the possibility of expensive last minute surprises. 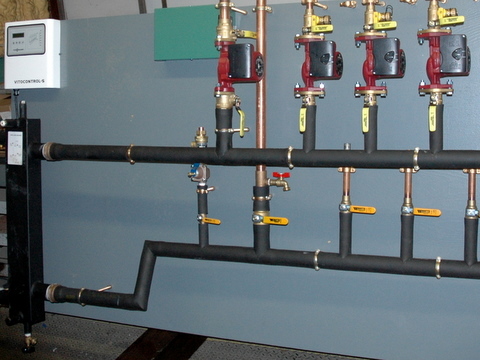 The completed piping ready for wiring by the Ryder Electric team. The last leg of the old boiler's trip to our truck. Notice the large rubber wheels on the articulating hand cart: these go easy on the landscaping so you don't have to call your gardner after we leave. Despite weighing aproximately 400 lbs, this boiler was removed from the basement by one man using the stair climbing hand truck in this picture and then wheeled across the lawn by two. With all the old equipment and unnecessary piping removed, we are ready to install the pumping and control board. The board weighs about 300 lbs, so we used the temporary legs seen here to get the board level and positioned on the wall before making the final hook-up. 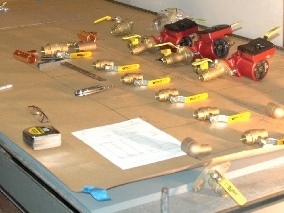 The board was prewired in our shop so it could be quickly brought on line after the pre-piped board was connected to air handlers. The new pump board is in place. You can also see where we laid out cardboard to protect the floors. Next we will do a little cleanup and apply a couple of coats of paint to the concrete floor. 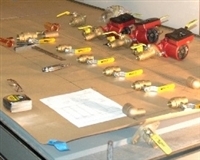 If you got closer to the valve handles, you would see the tags identifying which equipment is connected to what. We believe it's the finishing touches that can make the job. Finished pumping station insulated and tagged for zone identification. 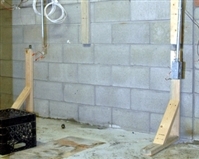 Originally this room was filled with equipment and low-hanging piping. 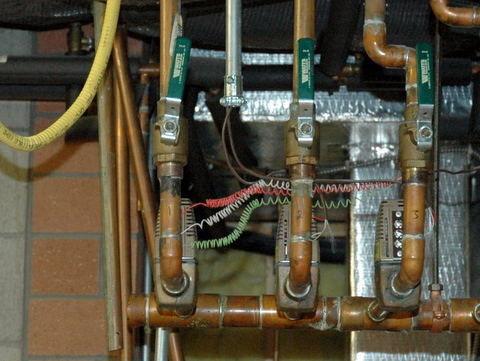 Now, the pipe all runs above head-height and the only footprint is the silver hot water maker (next image). In addition to properly heating the house, we created a new storage room! 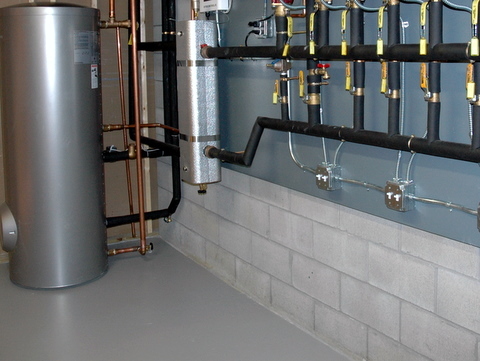 Final connections have been made, the new Viessmann hot water maker is in place, the floor is painted. Job Done. 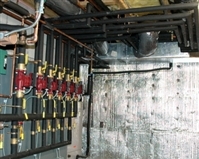 The new system uses two Viessmann Vitodens fully modulating boilers controlled by a Viessmann Cascade Control. 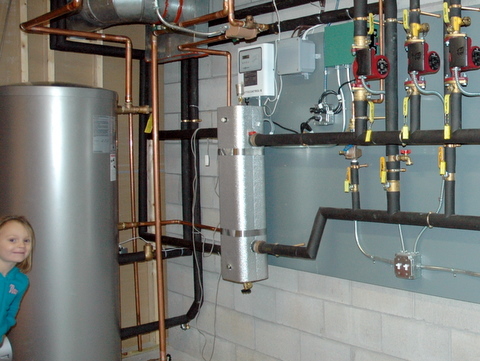 The system was designed with power and efficiency in mind and is capable of producing between 65,000 and 400,000 BTU's depending on the load required, outdoor air temperature and the supply water temperature. 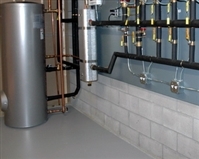 If the outdoor temperature changes, the supply water temperature is instantly adjusted to compensate. 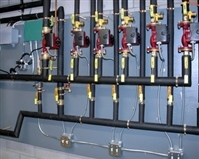 The controller even swaps between boilers to make sure that both get equal run-time within their most efficient operating levels. Quality Control Inspector gives her approval.